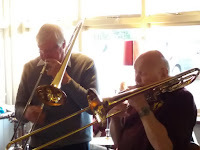 Bob Wade (trumpet/flugelhorn): Jim McBriarty (tenor sax/clarinet/vocals); Don Fairley (trombone); Colin Haikney (piano); Alan Rudd (bass); Ian Hetherington (drums); Olive Rudd (vocals) + Gordon Solomon (trombone). After a long and tedious X22 bus journey Jim McBriarty seemed to be commiserating with travellers when he sang Sent For You Yesterday (and here you come today). Fortunately, despite the devious route, it was all worthwhile. 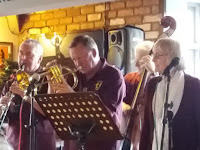 Ashington Jazz Club's new venue looks good and the room was packed, all enjoying the music and the free buffet. Whether the buffet is a one-off or a regular feature, only time will tell. What's for sure is that if you like your music north of Bourbon St. and south of 52nd St. then this isn't a bad place to be. The band live up to their name of Classic Swing - they could have the dead lindy-hopping in their graves. Tried and tested material - if it ain't broke don't fix it - that somehow still sound as fresh as tomorrow. One number I hadn't heard them do previously was the closing Trombone Cholly featuring Olive and Gordon. Keep it in the book! When Bob Wade announced It's a Wonderful World I thought great! The perfect number for Olive. Alas, it turned out to be What a Wonderful World - maybe next time. Bye Bye Blackbird had the two trombones in Jay & Kai mode, something they also did on Caravan to great effect. The Juan Tizol tune also had some blistering trumpet from Bob Wade and the inevitable drum solo - this time from the impressive Ian Hetherington. 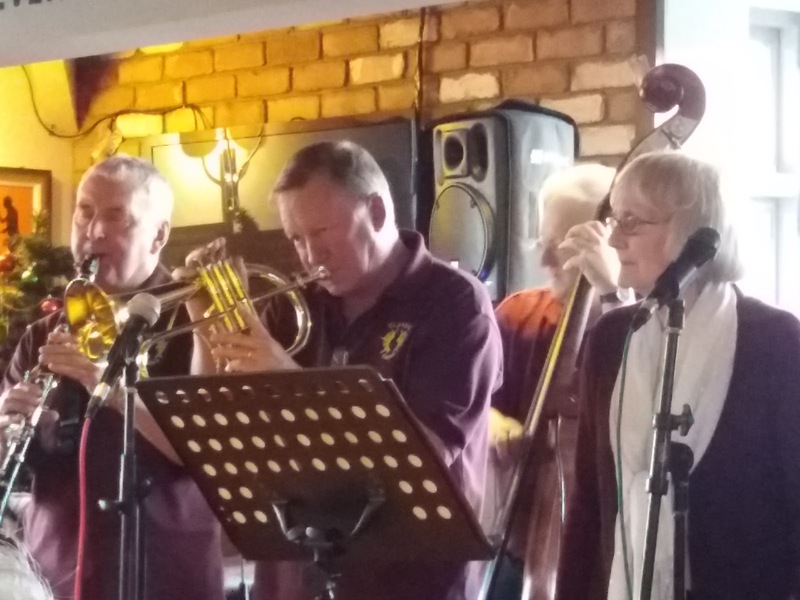 Jim McBriarty took to the mic again for Rockin' Chair, a number I'm sure some of the senior members in the audience could relate to, as well as hitting us with some gutsy tenor and nimble clarinet during the course of the afternoon. Colin Haikney made the most of his few solos whilst Alan Rudd was, as usual, his solid, dependable self. It may be out in the sticks but it's well worth the effort. Entry is free although the optional raffle isn't. Real Ale came in the form of Lancaster Bomber. Reasonably priced in today's economic climate at £2.90.